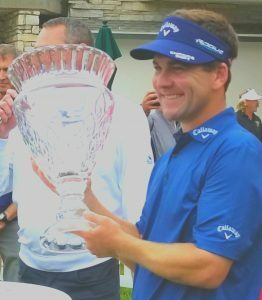 Chase Wright collects his trophy after his first Web.com Tour victory. Scott Cassin has been the tournament director of previous eight Web.com Tour events played at Chicago golf courses, and he never had to experience a sudden death playoff — until Sunday, that is. Chase Wright, in what might be the last playing of the Rust-Oleum Championship at Ivanhoe Club, rolled in a five-foot birdie putt on the second hole of a playoff with Alex Prugh to win the $108,000 first prize. Not only that, but Wright’s 72-hole score of 17-under-par 271 was the lowest winning score posted in the three years the $600,000 tourney was played at Ivanhoe. Max Homa, in 2016, and Stephen Jaeger last year were 13-under in their victories. Wright notched his first win in four seasons on the PGA Tour’s alternate circuit. It could be a life-changer, as Wright moved from No. 35 to fifth on the Web.com money list. He looms a good bet to finish the season in the circuit’s top 25, and those players advance to the PGA Tour in 2019. Actually it didn’t. Both Wright and Prugh singed the cup with birdie putts on the last hole of regulation play. Both also made pars on the first playoff hole and hit great approaches into the same hole – Ivanhoe’s No. 18 – on the second. Prugh’s stopped 12 feet from the cup, and he missed his birdie putt. Wright then made his five-footer for the win. Wright’s first win in 83 Web.com starts came in his second playoff of the week. He was also in one for a berth in next week’s U.S. Open in a sectional qualifier at Ridgewood, N.J., last Monday. Wright didn’t win that one and learned later that his status as an alternate won’t be good enough to get into the field when play begins at Shinnecock Hills in New York on Thursday. No problem there. Wright was happier to get a win that will have a more lasting effect on his career than just one that would get him into one big tournament. After two decent seasons on the Web.com circuit Wright struggled last season. He had to drop down to the Canada’s McKenzie Tour, but got a win there. That helped him regain his status as a Web.com regular. Now, thanks to Sunday’s strong finishes, both Wright and Prugh are in great position to advance to the PGA Tour next season. Prugh moved up from 61st to 23rd on the money list. Whether Wright can defend the title he won Sunday, however, is doubtful. Rust-Oleum’s three-year contract as a tournament sponsor concluded on Sunday and no agreement has been reached on an extension. Contributing to the unlikelihood of the tournament returning is the retirement of Tom Reed on April 30. An Ivanhoe member, Reed was the Rust-Oleum president when the tournament was created. The Web.com Tour has had a sporadic tenure in Chicago. Kemper Lakes hosted the first event in 2002 and the tourney moved to The Glen Club, in Glenview, the following year. It was contested there through 2008 as either the LaSalle Bank Open or Bank of American Open. Rust-Oleum’s run featured three days of good weather before Sunday’s conclusion produced a forecast of inclement weather. Play was started at 8 a.m. in threesomes off both the Nos. 1 and 10 tees and the lift, clean and place policy was invoked. It had only minimal impact on the local players who made the cut. Lake Forest’s Brad Hopfinger dropped six places from the start of play and finished in a tie for 22nd place. That dropped him from 38th to 40th on the all-important money list. Northbrook’s Nick Hardy, playing his first tournament as a professional, tied for 33rd with – among others – fellow University of Illinois alum Scott Langley. Langley, maintaining his No. 2 ranking on the circuit money list, was sailing along with his best round of the week until his last hole. Then he put two balls in the water and took a triple bogey eight, but still finished ahead of money leader Sungjae Im of South Korea. Hardy, happy with going all four rounds in his pro debut, will get another Web.com start in two weeks at the Lincoln Land Championship at Panther Creek in Springfield, Ill., thanks to another sponsor’s exemption. Then he’ll utilize two invites to PGA Tour events – the Travelers Championship in Hartford, Conn., and the John Deere Classic in downstate Silvis, Ill.